The monthly Maker Monday event takes place at 1000 Trades in the Jewellery Quarter. We are fortunate to be able to invite great speakers from across the broad arts, creative and technology arenas to entertain and inspire. 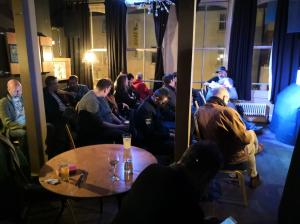 This January’s edition was no different as welcomed two amazing speakers in Mar Dixon and Adam Clarke. The STEAMhouse team met Mar Dixon at the ‘STEAMlab Urban Hack: The Future of Retirement Care’ where we invited her to share her story at Maker Monday. Mar Dixon needs very little introduction in the museum and heritage arena, managing projects with a huge impact on social good, creativity and connecting young people, audiences and communities to institutions and venues. Her funny and insightful talk encompassed an inspiring whistle-stop tour of several aspects of her work. 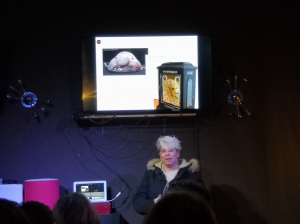 The first part of Mar’s talk focused on a number of her fantastic social media campaigns, in particular the power of the #hashtag as an enabler for great thoughts and ideas to flourish, in her own words, how to “listen, understand and act on what people want to do”. As Mar showcased, hashtags create great content and enable us to step back and understand what people are trying to do. Mar used some of her campaigns such as #whylovemuseums, #museumselfie, #lovetheatreday to demonstrate their popular and ‘global’ impact. 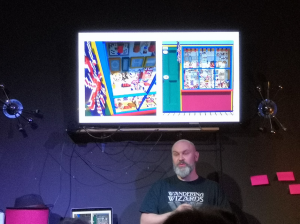 The second half of Mar’s talk provided some great examples of her events, starting with the REMIX toys and games event at BOM from 2015, inviting young people to make the most of their skills and to inspire their creativity through making. She also cited examples of her open innovation work in museums, such as Museomix, a global event bringing together museums, companies, start-ups, communities and the general public as well as her unconference work with #museumcamp. One of the big takes from Mar’s work was her own motivation to give back to young people and to inspire their creativity. It is within this context where our second guest was introduced. Our second speaker this month, Adam Clarke, plays Minecraft for a living. Of course, this underplays the nature of his own unique blend of, in his own words, “digital alchemy”. 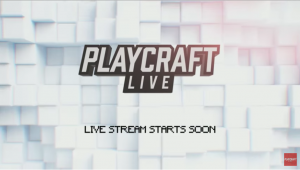 Adam talked about “Minecraft as art”, taking it outside of its usual parameters and using it in powerful and meaningful ways. 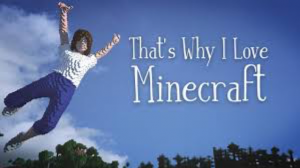 In talking about his own (Mine)craft, Adam explained that creating Minecraft art and combining it with photoshop (fakery pokery, as he describes it) takes as long to think about it as it does to produce. The examples of his work bear this out. 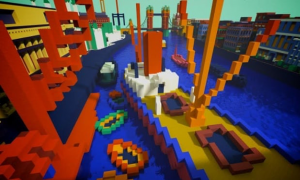 Tate Worlds, a project bringing Minecraft ‘maps’ to life that present virtual environments inspired by artworks from Tate’s collection such as André Derain’s The Pool of London. Link to Guardian article. The recreation of a real 72 foot temple designed by artist David Best brought to life in Minecraft simultaneously by Adam Clarke creating the impression of a temple high on a hill, towering over the city of Derry/Londonderry below. 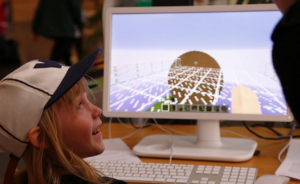 Created as part of Liverpool Biennial, to engage young people to create the largest Minecraft project in the world. Bringing the work of poet Victoria Bennett to life, inspired by her experience caring for her terminally-ill mother, and reliving some of the shared memories in her home. 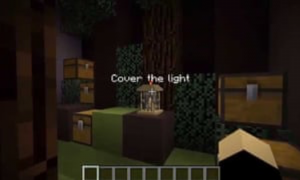 The world’s first play to be performed live inside Minecraft, a collaboration with Alex Scarrow and The Playhouse Theatre, Derry/Londonderry. An unofficial Minecraft book by Tony Walsh and illustrated by Adam Clarke channelling the positive world of Minecraft into a book format – the art was illustrated entirely in-game. In the concluding part of his talk, Adam provided a snapshot of some other innovations that he is really keen about right now. His motivations to make and create are going to some fascinating places. 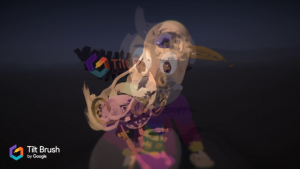 First, Adam is a fan of augmented reality and phone apps, and demonstrated Google’s Tilt Brush and its powerful AR platform. 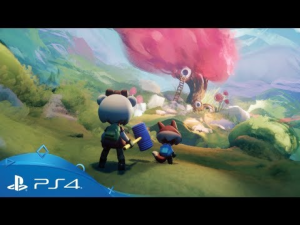 Finally, Adam talked with gusto about the new PS4 game Dreams, an open-ended adventure game which enables young people to create worlds in a variety of possibilities. .
To go full circle back to Mar Dixon’s work with hashtags, the small community of makers using Dreams have been sharing their amazing work by using the hashtag #DreamsPS4. A huge thanks to Mar and Adam for their expertise and contributions. Follow Mar Dixon @mardixon on twitter. Follow Adam @thecommonpeople on twitter. The next Maker Monday will be on Monday February 25th at 1000 Trades. You can book your place here.